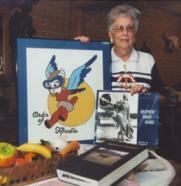 I was born in Magnolia, Texas on August 30, 1919. I graduated from high school in 1935 at the age of 15. There were only eight in my graduating class. After leaving Magnolia for short periods of time for college and then during World War II and the Korean War to join my husband, a radio operator, at several military bases in California, I always returned to Magnolia. We finally settled here in Magnolia and raised two children. I am a firm believer in preserving history for future generations. In 1993 I published a 600 page book called "Magnolia Memories." My dad was a photography buff and had many photos of early Magnolia. Many of these are in the book, which also recorded biographies of early settlers. I am secretary-treasurer of the Historical Committee in Magnolia. As our main project, an old depot that was built in 1902 was purchased and renovated and has a small museum in its freight room. A historical marker was obtained and the building was dedicated this year. During World War II, I was a dispatcher for the Civilian Pilot Training Program for Aviation Enterprises at Municipal Airport. A contract was awarded to the company to train women pilots. At first I was apprehensive, but then I came to have much respect for these wonderful ladies who left their homes to serve their country in this manner! 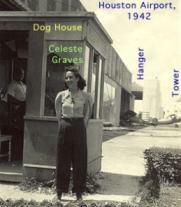 A VIEW FROM THE DOGHOUSE was written to preserve the stories of these heroines of World War II.